Ahhh to be a child again! Their world’s are so carefree and their imagination is only limited to what they can dream. Children’s rooms are one of the best rooms to be creative in because there is no limit to the inspiration. From themes such as sports, books, characters, colors and more, your child has so many options for a fun and inviting room. Cool furniture is another way to help your child love their interior environment. From awesome themed beds to lighting and creative decorations, here are ways to help your child find comfort in retreating to their room every night! Like any bedroom the bed usually takes front and center stage and in a child’s room it can set the tone for the rest of the space. Whether you decide on a colorful retro styled crib for your infant or you choose a whimsical forest or dollhouse inspired bed your child will love it. Decide what type of theme your child is into and then measure out the space needed for the bed you desire. Many loft beds and bunk beds can save space by using vertical height and allow more floor room for kids to play and move around. Also remember when choosing beds the age of your child, many intricate beds that have a ladder or stairs can be tricky for little ones – especially in the middle of the night! How cool is this child’s bed? Another wonderful aspect of kids’ room is the ability to add inspiring color without feeling like you went overboard, after all kids love color and what better place to show it off? Paint colors, bedding, area rugs and window treatments are the perfect place to add color. Choose a color palette that is inviting to the space but also plays along with the source of lighting. Too dark of colors in a small room that doesn’t have an ample source of natural light could feel dark and cave-like. Instead opt for lighter walls and perhaps use the darker and more powerful colors in their furniture instead. 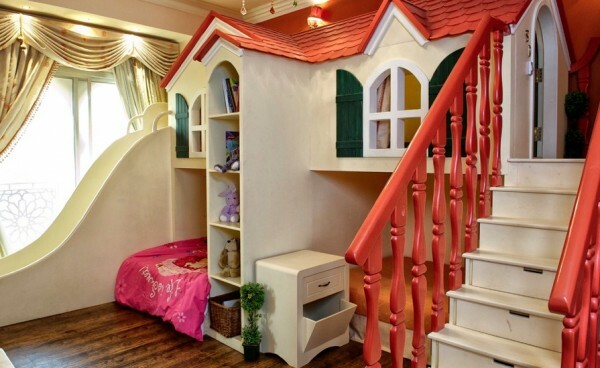 If your children share one room consider how to please all of them with creative furniture. Bunk beds that are built-in to the wall similar to a ship is one great idea. This enables more children to sleep in one room but the lighting can be customized for each space. A small reading light as well as unique bedding that coordinates with the other “bunks” is a creative ways to solve multiple kids’ tastes in one bedroom. Also opt for creative lighting such as pendant fixtures and fun table lamps at desks and dressers to illuminate their cool room.